Previous names include Hawkin's Spring and Barker (after the post office). The name is said to have been suggested by a homesick Scottish train engineer after his hometown in the old country. The change was made in 1882 or 1883 when the Gulf, Colorado and Santa Fe Railway railroad arrived. 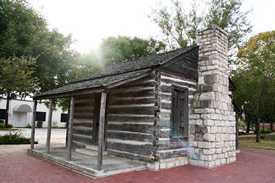 A log cabin with an earthen floor was the community's first school, church, and community hall. 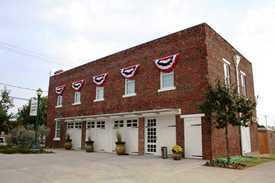 A post office was granted under the name Barker, Texas in 1877. Populations of Midlothian for various years: 1884: 300, 1892: 600 to 800, 1896: 1,000, 1950s: 1,175, 1980s: 5,087, 1990s: 5,141, and currently 7,480 (2004). Midlothian was incorporated in April 1888 when at least twenty-five essential businesses were in operation, including a millinery, confectionery, bakery, and a weekly newspaper ( the Midlothian Visitor). In Kimmel Park a private boarding school called The Polytechnic Academy is remembered by a historical marker. It later became the Polytechnic Institute and then the Whitten Institute and Midlothian College before merging with the town's public schools in 1903. 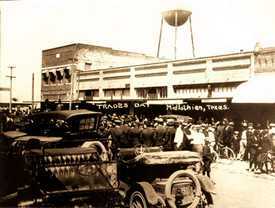 By 1896 Midlothian was thriving with sixty-two businesses. Two years later the Midlothian Oil Mill and Gin Company opened - operating fourteen gins at its peak. In the mid-1970s Midlothian started becoming a bedroom community of Dallas and Fort Worth although the downtown area has retained it's charm with the restoration of many of it's historic buildings. 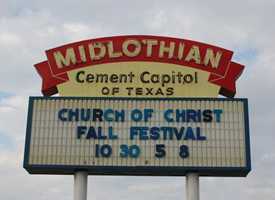 In the 1980s Midlothian became known as "The Cement Capitol of Texas." Though Midlothian proper was left essentially unchanged, the school district has expanded greatly. Joe Pool Lake is a 7, 400-acre impoundment with a 64 mile shoreline that serves as a reservoir for Midlothian. 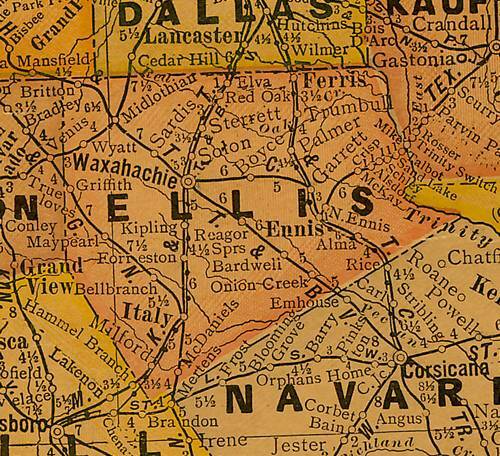 The northeastern corner is in the city limits of Dallas, and most of the remainder is in Grand Prairie, but the lake also touches city limits of Cedar Hill, Mansfield, and Midlothian.